Trainer Peter Gelagotis said Thursday morning he thinks two-time Group 1 winner Malaguerra is ready to roll ahead of Saturday’s $1 million Winterbottom Stakes (1200m) at Ascot in Perth. Malaguerra, above, currently sits on the third line of betting ahead of Saturday’s Group 1 Winterbottom Stakes. Photo Credit: Ultimate Racing Photos. 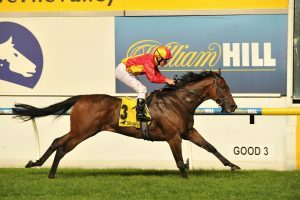 The seven-year old will don the blinkers after running a disappointing 12th first-up at Moonee Valley in the Group 1 Manikato Stakes earlier in October, a move Gelagotis hopes will calm the veteran’s nerves. Saturday will mark Malaguerrea’s second start in over a year, but Gelagotis told RSN on Thursday that this time around his horse has ticked all the boxes. “My gut feeling, I think the horse is in pristine order and got plenty to give still as a seven-year old. Jockey Ben Melham will saddle Malaguerra in the Winterbottom for the second time this weekend. Melham said on Thursday the pair have “unfinished business” after running fifth in the Group 1 feature in 2016, but this time around, the barrier draw looks to be in their favour. “I think we’ve drawn an exceptionally good barrier this time for a change, and the horse is going to get every possible opportunity to do his best” Gelagotis went on to say. Malaguerra has drawn barrier 7 this weekend and is currently at $8.50 odds with Ladbrokes. Melham told RSN earlier in the week that he thinks the blinkers adds “two lengths” to Malaguerra, while Gelagotis hopes lengthy spells and plenty of rest will give him an advantage over the rest of the field. Full 2018 Winterbottom Stakes odds can be seen below.